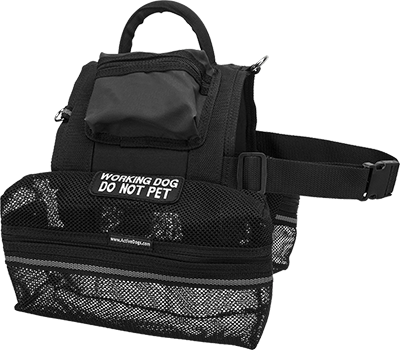 For our Mesh Bag Vest, we have taken concepts from our Day Trip Pack Vest and our Mesh Vest, and combined them to create our Mesh Bag Vest. This vest addresses the need for a lightweight air breathing vest that has the ability to carry items such as water bottles. 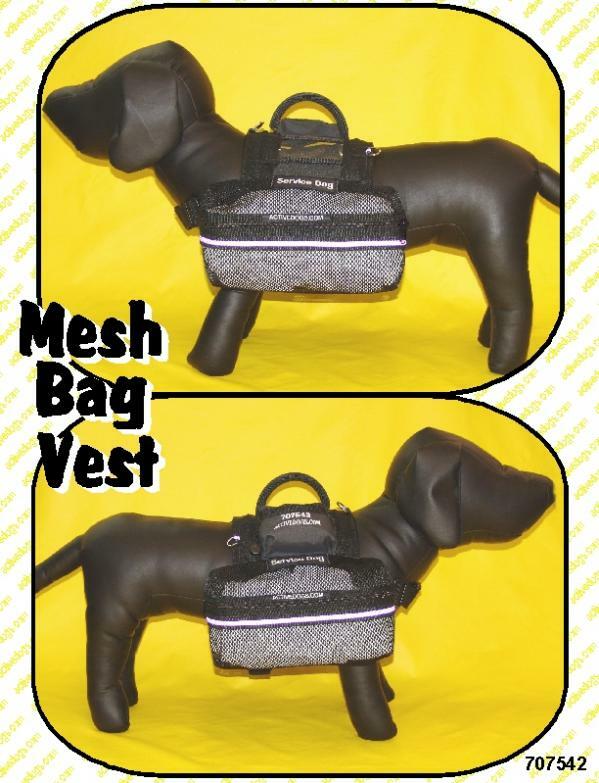 The Mesh Bag Vest has two side bags made from thick mesh. 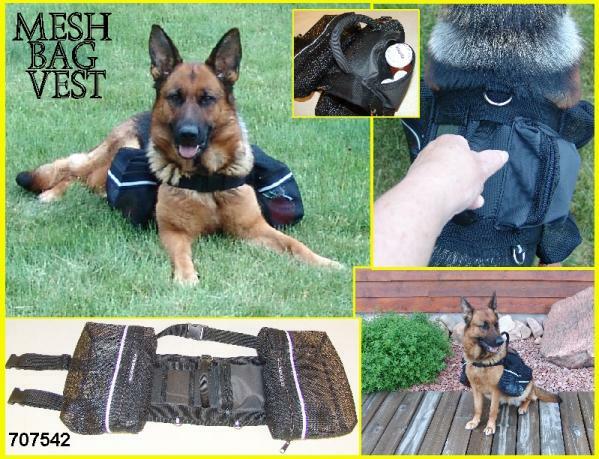 On top of the vest is a foam padded back plate with handle, clear vinyl ID Hook and Loop closing pocket and a small solid fabric zippered pouch for small items such as car keys, cell phone, or a pill bottle. The front chest strap has double slides on it for extra adjustment and there are two adjustable girth straps to keep the packs in place. All three straps are able to open with attached side release buckles. On the top of the back plate there is a heavy welded D-ring for leash attachment and two small back D-rings, to attach a bridge handle. The bags are large enough to fit a quart size bottle in. The dimensions of the side bags are 3” Deep x 11” Wide x6” Tall. 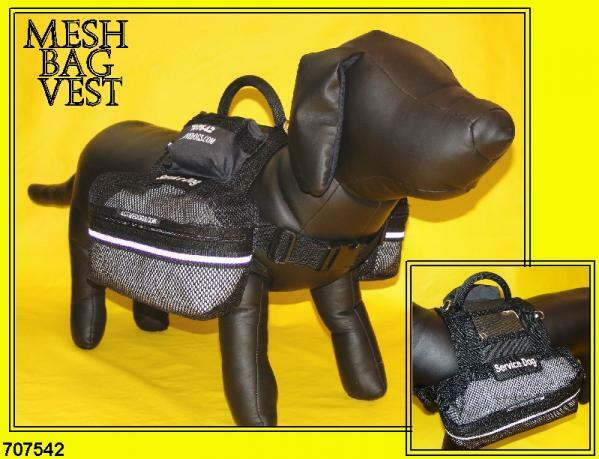 This Mesh Bag Vest will fit a girth measurement from 30” to 39”. 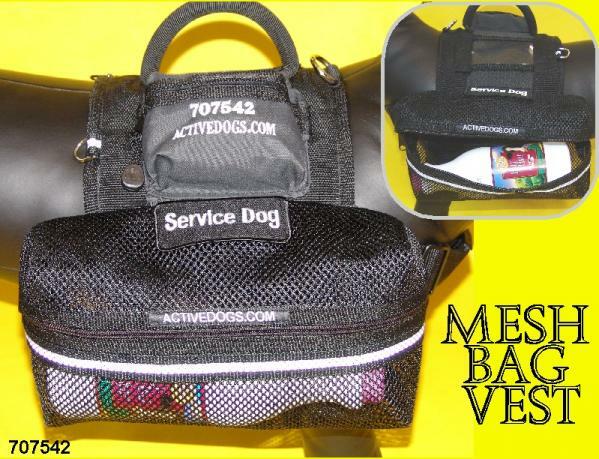 Mesh Bag Vest comes with 2 regular patches of your choice. This vest is not recommended for small dogs. > Please specify where you would like your patch(es) located on the vest in the “Patch Placement” field in the shopping cart (e.g. Service dog patch: left, middle) This vest is not recommended for small dogs.